When registration is done on multiple computers, each one will have saved on it (in the project directory) a registration database. For a project named project_name and 2 computers that were given registration IDs 1 and 4, you will create the merged database by compiling the files project_name_registration_1.json and project_name_registration_4.json. The "Remove" button removes a selected filename from the list. When all of the registration databases to be compiled are on the list, then press "Compile". The "Compile" operation will create two new files: A merged registration, that will be saved as project_name_registration_compiled.json; and a timing dictionary, that will be saved as project_name_timing_dict.json. The merged registration is a normal fsTimer registration database file that could be opened, for instance, in the Registration window. It contains all of the entries from all of the compiled databases. 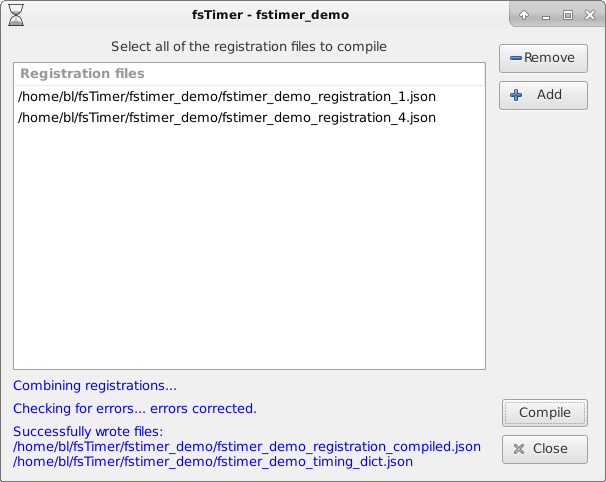 The timing dictionary is a dictionary that allows fsTimer to look up runner information (registration fields) by bib ID. 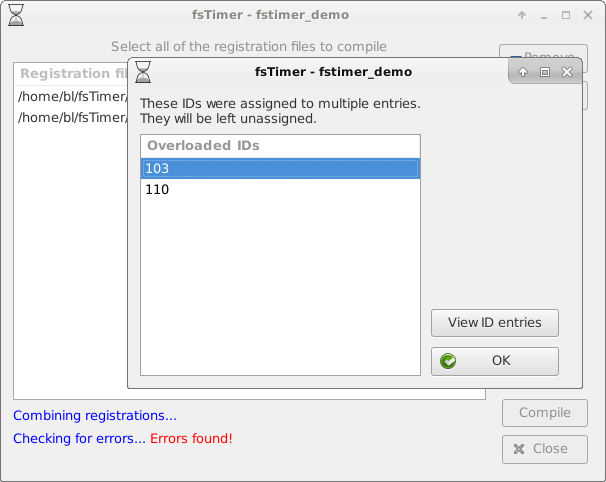 When a runner's bib ID is entered into the Timing module of fsTimer, it will use the the timing dictionary to look up what the corresponding registration information is. Under normal operation, pressing Compile will work nicely, the registration databases will be combined and the files written. Notice that on the Compile window it now says "Errors found!" in red on the bottom, and a new window has popped up with a list of the overloaded IDs. In the above screenshot, IDs 103 and 110 were overloaded, meaning that they were assigned to multiple entries. We should briefly note that this means unique entries - if the same ID is used in multiple registration database files along with the same other information (Name, age,... all of the registration fields), then this is not a problem. In the image above, we see that Gene Gomez and Tiffany Parker were both assigned bib ID 103. When this happens, there are two ways to proceed. If you know which of the entries is the actual runner with bib 103, then you can select that entry and press "Keep entry". For example, selecting Gene Gomez and clicking "Keep entry" will mean that in the merged database (and the timing dictionary), Willie will have the ID 103, and Tiffany will be left with a blank ID field. In a real race scenario, the time interval between closing registration and starting the race is usually pretty short (we close registration 15 minutes before the race starts), and so there simply is not time to figure out which is the correct entry. In this situation, just press "OK" and then press "OK" in the overloaded IDs window. When you press "OK" in overloaded IDs window, it leaves all overloaded IDs unassigned. This is the right thing to do, unless you actually know which are the correct entries. When the runners cross the finish line, they will still show up in the results, but they will just show up by bib number alone, and without their registration info (name, etc.). Unfortunately this means that they will not show up in the divisional results, but this is something that you can correct after the race when you have time to actually figure out what the correct entries are. The Compile window says at the bottom "errors corrected" and will print the names of the compiled registration database file and the timing dictionary file. 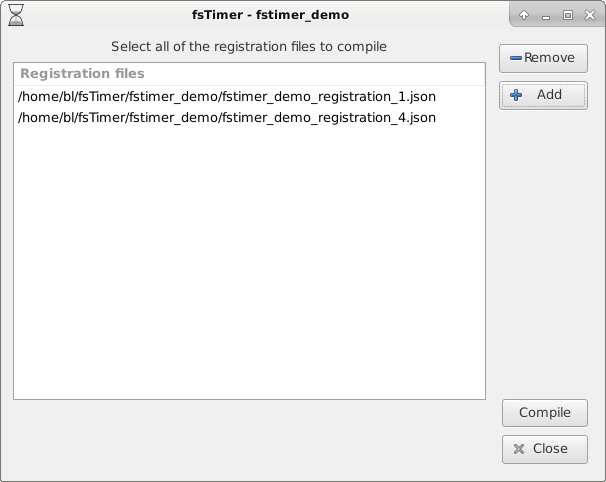 In addition to the timing dictionary and the compiled registration database in fsTimer format, fsTimer will also save a csv spreadhseet containing the merged registration information to the file project_name_registration.csv. This is useful for having a portable spreadsheet with all of the registration information collected day-of. As a final note, as was mentioned in Section 2.4, even if there is only one registration database to be used for timing (i.e., there is nothing to merge), you must still compile that one registration database so as to create the timing dictionary. Continue on to Race timing - details.